Celeste Parker is used to hearing scary stories about werewolves--Legend's Run is famous for them. She's used to everything in the small town until Brandon Maddox moves to Legend's Run and Celeste finds herself immediately drawn to the handsome new student. But when, after an unnerving visit with a psychic, she encounters a pack of wolves and gorgeous, enigmatic Brandon, she must discover whether his transformation is more than legend or just a trick of the shadows in the moonlight. I don't even know where to begin with how much I love this book. But first and foremost I made sure that I wasn't being biased by how much I like Ellen Schreiber as an author. When I began to read Once in A full moon I cleared my mind so that I could remain unbiased while I read the werewolf tale. It easily became one of my favorite books along with the Vampire Kisses series. I just love Ellen's writing and story-telling style and couldn't help but fall in love with this series as well. Ellen really has a gift for making irresistible guys, I immediately fell in love with Brandon Maddox just as I had with Alexander Sterling from the VK series. Many people have said that the story was overly cliche and cheesy but I don't really disagree, however that isn't a bad thing. At least not in my opinion, I'm a sucker for cheesy, sappy cliche books. :) Bite me. When reading this book I noticed a pattern in Schreiber's writing style. She tends to make social conflicts within the towns that she creates in her novels. The east and west siders don't get along, being on different sides of the tracks and social scale. But it makes the book all the more interesting. I loved the immediate chemistry between Celeste and Brandon, you could tell that they were perfect for each other from the get go. I could literally not put this book down when I read it, shutting out the rest of the world. It had been blowing crazy winds around here (if you guys hadn't heard we got about 6 tornadoes out here in Colorado :S yeah...yikes but thankfully no one got hurt) but the day before the tornadoes and floods happened, I was planted outside in the gusting wind just reading along. I didn't even bother going inside because I was just too immersed into the howling good book. What I like about Ellen's paranormal stories is that she sticks to the very basics of the creatures and doesn't alter the paranormal beings. Don't get me wrong there are a lot of paranormal books that I love that have had the author switch up the creature's characteristics. But I really love how Ellen made the werewolves purely werewolf as in transitioning at the full moon, turned by a wolf bite, lethal 'allergy' to silver and the eternal bond of a mate who accepts them in their true form. The book cut off at one of Ellen's infamous cliff-hangers making me thirst for more. I am dying to run to the bookstore to get the sequel to the Full Moon series, Magic of the moonlight to find out what happens to Celeste and Brandon's budding romance. 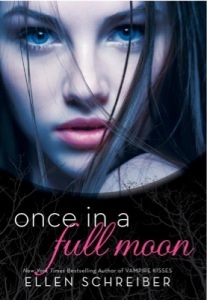 Once in full moon is MTV's Teen Wolf meets the magnificent story telling of Ellen Schreiber to create a story that will really knock your werewolf socks off. OHHH I'm glad you loved this one that much Noellie :) !! I heard of it when it came out but I hadn't really read a review on it until yours :)!! I look forward to read this one now! Glad that you're back in the blogging world too ! !